Paul Kinzer is back! In this installment of our Summer Stargazing Q&As, he answers our questions about the planets we might see tonight and cool deep space phenomena in the sky this summer. Here are Paul’s more tips for sighting planets, meteor showers, and globular clusters. Check them out tonight and then tell us what you saw with the hashtag #WhyIStargaze. If you missed our Q&A with Paul last week on finding bright stars and constellations, catch up here. Will I be able to see any planets? When and where can I look for them? Planets, unlike stars, are not constant. We can see the Summer Triangle every summer, and Scorpius always shows us the Cat’s Eyes in July and August. This is because the stars are so far away that they don’t seem to be moving relative to the earth (though they are). They’re like a distant mountain seen from a moving car. But the planets are much closer to us, and as we and they revolve around the sun, we see their motion over time — days, weeks, months, and years — like celestial telephone poles whizzing by. In fact, the word ‘planet’ once meant traveler or wanderer, and the name was given to objects that moved against the background of stars. There were originally seven ‘planets’: Mercury, Venus, Mars, Jupiter, Saturn, and the Sun and Moon. 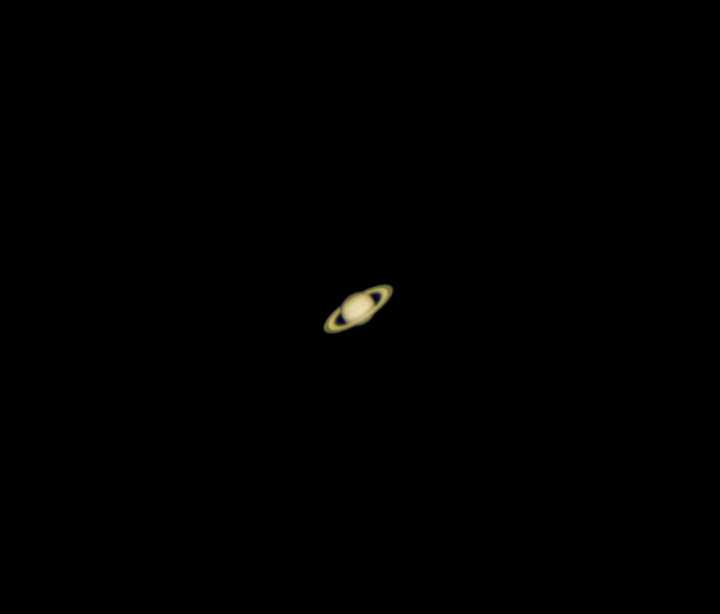 Saturn as it looks through a telescope. The closer they are to the sun, the quicker the planets move. Mercury takes 88 days to circle the sun, Venus takes 225. A Martian year is almost two of ours. Jupiter takes twelve years to orbit the sun; Saturn takes thirty; Uranus, 84; Neptune, 165; and Pluto, if we want to count it (and I do), 248. Because of their varying rates of motion, and our own movement, in some seasons several planets can be seen, but then few or none in that same season a year or two later. The best planet to view this summer is Saturn. It is visible in the south and southwestern sky as soon as it gets dark. It will get lower each night as we move around the sun, so the sooner you look for it the better you will be able to see it. And once you find it, if you can, look at it through a telescope. Even a small scope, magnifying no more than 50 times, will show you the rings, with the ball of the giant planet floating inside them. The rings are quite wide open now, and will continue to get wider for the next few years, before slowly closing again in their fifteen year cycle. To find Saturn, use the Big Dipper as a guide. Note that the handle, together with the side of the bowl facing the handle, look like they form a part of a circle; an arc. Starting at the bottom of the handle side of the bowl, draw an imaginary line along this arc, and continue it after reaching the far end of the handle. This imaginary line will lead to the star Arcturus, in the constellation Boötes, the Herdsman. Stargazers say that you can ‘arc to Arcturus’. Once you find Arcturus, you can then ‘spike to Spica’, by continuing to the next bright star, about as far from Arcturus as Arcturus is from the end of the Big Dipper’s handle. Spica is the brightest star in the constellation Virgo, the Young Woman. This summer, the planet Saturn is the closest bright ‘star’ to the left of Spica. 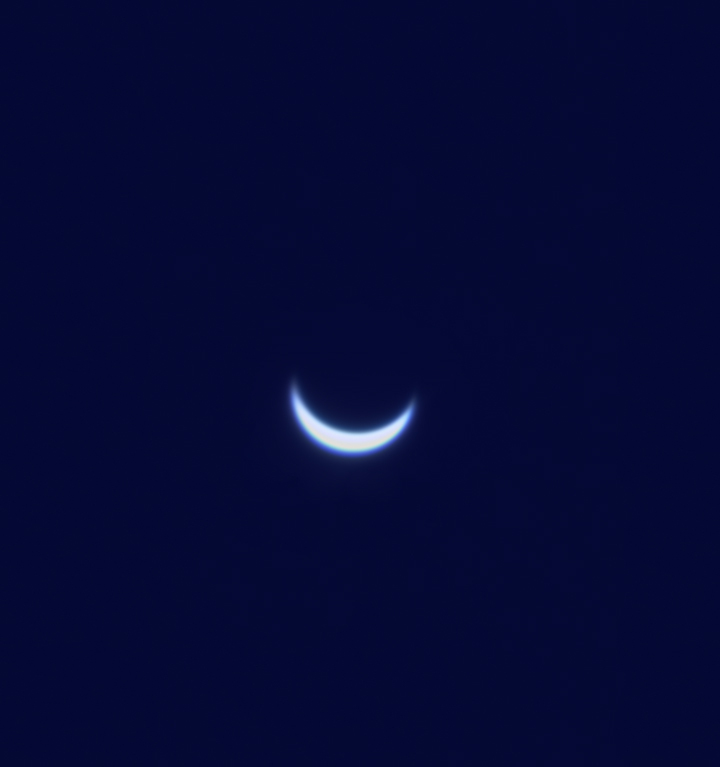 When closer to earth in its orbit, Venus shows a crescent phase, seen easily in even the smallest scopes. Venus is the ‘Evening Star’ this summer. Like Mercury, it is closer to the sun than the earth, so it always either follows or leads the sun across the sky. In July and August, look for the brightest ‘star’ in the low western sky just after sunset. It sets early every night. Like the moon, Venus (and Mercury) can show us phases, from crescent to full, and when Venus is closest to the earth, even a small telescope can show its crescent phase. Unfortunately, this summer it will be a much smaller round-ish blob, since it’s in a different part of its orbit. Mars and Jupiter are too close to the sun to view in the evening sky this summer. They are both currently rising in the very early morning, before the sun. As the months go by, they will rise earlier and earlier. Jupiter is always bright when it is out at night, since it is so large, and it will dominate the evening sky by late fall. But Mars is a tiny planet, and will be quite dim until it gets closer to us in its path around the sun, next spring. Like Mars and Jupiter, Mercury can be seen in the pre-dawn sky, starting in mid-July. But it travels so quickly around the sun that, by mid-August, it will be too close to it again for us to see. Mercury is always difficult to find, and since it so close to the sun, it can never be seen in true darkness. The farthest three planets can only be seen with telescopes, so explaining just where to find them is difficult. But they move so slowly across the sky that they will stay in the same area of the sky for years. Pluto is currently in the constellation Sagittarius. Neptune will be in Aquarius for the next several years, and Uranus is in Pisces. All three of these constellations are up in the southern summer sky (Aquarius and Pisces later at night, or later in the summer). Accurate charts showing these planets’ exact locations will be needed to find them in a telescope. These charts can be found online, or about once a year in astronomy magazines. Uranus, through even a small scope, shows a small bluish disk, and Neptune shows an even smaller one. This makes them easy to distinguish from stars, which always show as points of light, even in large scopes. Pluto is so tiny, and so far away, that it looks like a very dim star, even in scopes big enough to show it at all. I’ve never seen it. Are there any deep space objects or out-of-the-ordinary cosmic events that might be visible? There are too many to count, so let’s just pick two that are quite different, but both easy to see every summer. The first is 25,000 light-years away (that’s about 147,000 trillion miles), is 150 light-years across (885 trillion miles), and contains hundreds of thousands of stars. The other is made up of grains of sand and small rocks, which, when we can see it, is only a few dozens of miles away. Very different, but both beautiful in the nighttime sky. 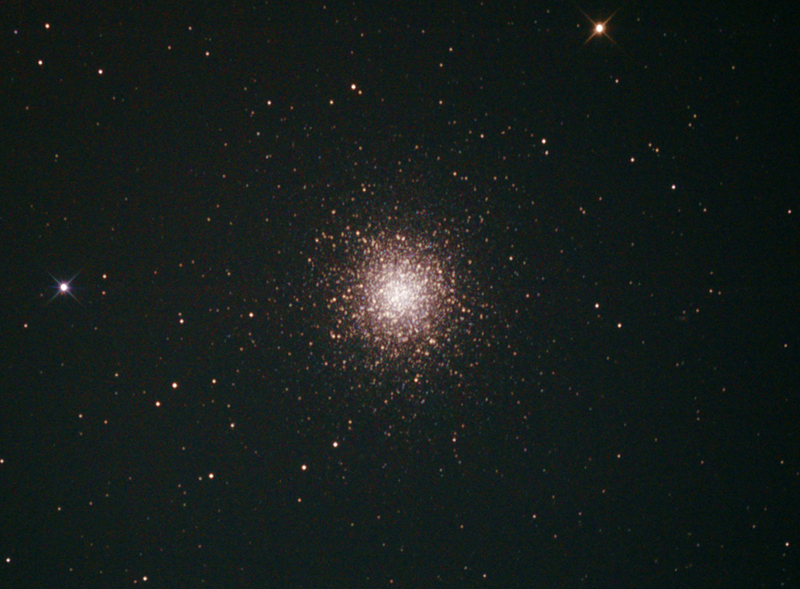 M13 as it looks through a mid-sized scope. The cluster is actually quite large in the sky, about half the size of the full moon, but only the bright center is visible to the unaided eye, and dark skies are needed for that. The first item is sometimes called the Great Globular Cluster in Hercules, but astronomers usually call it M13 (the thirteenth item on an old and famous list of non-starlike objects in the sky). The Milky Way galaxy has a spherical halo of these globular clusters, about 150 of them, orbiting the galactic core. (Other galaxies have them, too.) Globulars are tight collections of stars, held together by gravity, and they contain, possibly, the oldest stars in the galaxy. M13 is one of the most famous globulars because it is bright and located high in the northern sky. It can be seen as a fuzzy starlike smudge under dark skies with good eyes. With binoculars, M13 can be clearly seen to be more than a point of light, and with a small telescope, individual stars can be made out. To find M13, you need to locate the ‘Keystone’ in the constellation Hercules, the Hero. The keystone gets its name from its shape: a trapezoid that looks like a stone used in a Roman arch. I find the easiest way to find the Keystone is to locate the Summer Triangle, and draw an imaginary line from Deneb, in Cygnus, through Vega (the brightest star in the Triangle), in Lyra. The center of the Keystone is about the same distance from Vega as Deneb is, in the opposite direction. Finding M13 in the Keystone is not difficult: it is along the longer side of the trapezoid that is furthest from Vega. Just start at the top star and move downward. If you get to the bottom star without seeing the cluster, slide back up and try again. The other item I described cannot be seen on any night of the summer, because it is not a single object, but an event: the Perseid Meteor Shower. Meteors are often called ‘falling stars’ or ‘shooting stars’, because they are streaks of light that zip across the sky, about the size and brightness you’d expect if a star suddenly took flight. But, though people long ago had no way of knowing differently, meteors are nothing like stars. Stars are balls of gas, typically on the order of a million miles in diameter or more, and all of them, save the sun, are trillions of miles away. Meteors are typically the size of a grain of sand or a small pebble, though they are sometimes larger, and rarely, much larger. But never anything close to planet-sized, let alone star-sized. Space has lots of bits in it. The bits are spread thinly, but space is big, so has room for countless bits. The bits include galaxies, star clusters, suns, planets, asteroids, comets, and the tiniest bits, which we call meteoroids (when it’s in space, it’s a meteoroid; when we see it in the sky, it’s a meteor; if any of it survives to reach the surface of earth, that’s a meteorite). 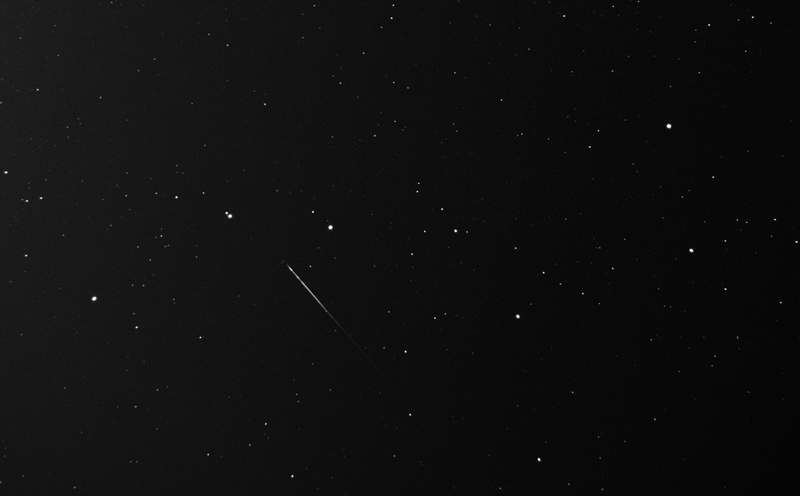 When you see a shooting star, you are really seeing a tiny bit from space slamming into our atmosphere and interacting with it. Unless the bit is larger than a good-sized rock, it will likely disintegrate high above the ground. You can see these bits being destroyed on almost any clear night; there are some of them just about everywhere. But in some parts of space, the smaller bits lie thicker. Comets are balls of frozen gasses, mixed with rock and dust. They usually lie far, far from the sun, where they’ve been since the Solar System formed. But sometimes, something disturbs one of them, and it starts drifting inward, pulled very gently, at first, by the sun’s gravity. As it gets closer, it speeds up, like a ball rolling down a hill. When it gets close enough, the frozen gasses — water, carbon dioxide, ammonia, methane — start to melt, and steam away from the comet, along with rock and dust trapped inside the ‘dirty snowball’. 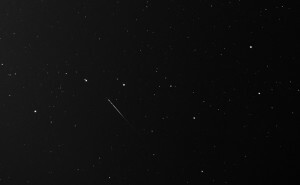 This is a photo of a meteor coming from the direction of the constellation Leo, the Lion, which lies ‘under’ the Big Dipper in the sky. Since it was taken on November 17th, I know it’s a member of the Leonid Meteor Shower, which happens each year around that date. Where comets pass, they leave behind parts of themselves, and along their paths, long after they’ve whipped around the sun and left the scene, the thinly spread bits lay more thickly in space. When earth passes through one of these paths, the number of meteors rises, sometimes dramatically. We call these increased meteor falls ‘meteor showers’. Since the earth travels around the sun once a year, these showers happen predictably, on or near the same dates every year. While plowing through the streams of comet waste, the meteors can appear anywhere in the sky, but all shower meteors will seem to come from the same direction; that is, if you followed back along the path of each meteor trail, the lines radiate out the same spot in the sky. This spot is therefore called the ‘radiant’ and showers are named for the constellation that contains it. There are more than a dozen major showers each year, and probably the best known is the Perseid Meteor Shower. It doesn’t have the most meteors, but it is fairly consistent (some showers vary greatly in intensity from year to year), with about 60-80 meteors per hour; it is more prominent in the northern hemisphere than the south; and it happens when the weather is warm: the night of August 11th/early morning of August 12th. This year, there will be a fat crescent moon in the sky on the night of the 11th, but it will set before midnight, and the shower peaks after that: after midnight, the skies above that part of the earth are facing into the direction the earth moves along its orbit, so for folks looking up into the sky, they’ll be looking into the debris stream of the comet as we plow through it. The shower actually starts a few nights before the peak, and continues after for a few nights as well. If you can, and if the sky is clear, go out that night to the darkest spot you can get to with wide open skies. You don’t need or even want a telescope or binoculars. There’s no way to know where in the sky a meteor will appear, and they last no more than a few seconds, and usually less. They can be very dim, but also very bright indeed. Bring a lawn chair, or a sleeping bag, and recline with your eyes open to the wide sky, not some small part of it. You’ll miss plenty of them because you cannot see the whole sky at once, but you’ll see plenty, if the sky is dark enough.